CWL designs transport plans based on a network of approved suppliers, and then coordinates them with the involvement of its international teams. With air and ocean consolidation platforms in every major international hub, we are able to provide a broad range of groupage and logistics services. Being an expert in multi-modal transportation, we handle services through Ocean, Air, Railways and Roadways. Our multi-modal transport services includes all chassis types of truck, combined transport system by Rail, Road and Ocean. Transmarine Services India Pvt. Ltd.
we offer a wide range of multi-model transportation services to our clients. Our clients can avail from us a any type of transportation option as per the requirement ad be assured of the safety of their goods and consignments. We offer these services at an competitive market price and also strictly abiding by the various rules and regulations. Multimodal transport is the transportation of goods with at least two different mode of transport. 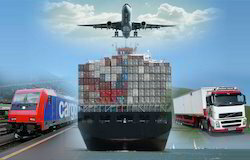 Cargo delivery time and price can be much reduced by utilizing the Sea and Air freight services. An important benefit of multi-modal transport is that it has the flexibility to give customized solutions to the varying needs of the shipper or the consignee. Her own fleet of cargo delivery vehicles has given Quatro an edge over the competition and a firm grip on the road to logistics. 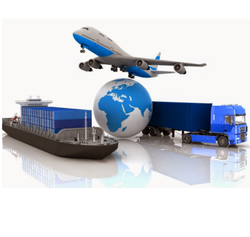 Akayam Logistics is proud to be affiliated with his Domestic and International Multimodal Transportation services. We offer door to door service for all type of cargo with alltime ready inventories of 20' & 40' tailors, all type of Lauri Trucks for bulk cargo transportation, Tankers for Liquid cargo Transportation. Skyline Shipping & Logistics Pvt. Ltd.
Multimodal transport (also known as combined transport) is the transportation of goods door to door under a single contract, but performed with at least two different means of transport; we as a carrier is liable for the entire carriage, even though it is performed by several different modes of transport by rail, sea and road. As transport specialist in various trades, logistics division provides a full transport service for import and export cargo with the emphasis on commodity logistics and inland transportation by rail, barges or road. Our people are also experts on cargo handling, customs clearance, warehousing, distribution and insurance. We are occupied in providing Multi Modal Transport Services, which is handled by industry acknowledged professionals who employ the advanced technology to complete these services within given time frame. These services are obtainable in varied forms that meet on clientele demand.